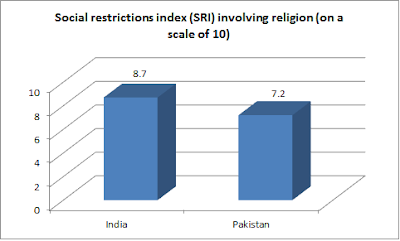 A peep into the data collected by Pew suggests that, on a scale of 10, India’s government restrictions index (GRI) as well as social hostilities index (SRI) has deteriorated. If it was 4.5 for GRI in December 2014, it reached 5.1 in December 2015. As for SRI, it was 7.9 in December 2014, which reached 8.7 in December 2015. Worse, compared to the neighbouring Pakistan, India’s SRI is higher by 1.5 points: For Pakistan it is 7.2 in December 2015 (down from 8.1 in a year), as against India’s 8.7. 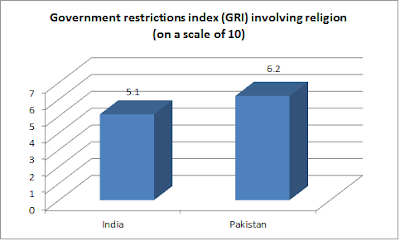 As for GRI, Pakistan fares worse that India, with a score of 6.2 in December 2015 compared to India’s 5.1. GRI has been arrived at by assessing the level of restrictions on religion by governments around the world by seeking answers to 20 questions from several published sources of information, including reports by the U.S. State Department, the United Nations and various nongovernmental organizations. Answers sought include such questions like whether law allows freedom of religion, whether public preaching by religious groups limited by any level of government, and whether government interfere with worship or other religious practices. As for SHI, these are based on answers on 13 questions from similar published sources of information. Here, the questions include whether there were incidents of hostility over proselytizing, whether there were crimes, malicious acts or violence motivated by religious hatred or bias, and whether there was mob violence related to religion.